Ken Brooks 8th Degree Black Belt Taekwondo, 7th Degree Black Belt Hapkido, Grand Master Instructor, Vice President of Taekwon-do International. Master Brooks is a 3 time world record holder in speed board breaking. Ken is a former National Taekwondo Champion and has coached several national champions in Taekwondo. He was a member of 2 US National Teams and has trained, tested and certified in <?xml:namespace prefix = st1 ns = "urn:schemas-microsoft-com:office:smarttags" />Korea. After earning his black belt in 1974 he began instructing and became certified in 1976. He has trained and competed extensively throughout the United States. Mr. Brooks formerly served as a Regional Director and Vice-President in the ATA (American Taekwondo Association) and is the President of the ATHA (American Taekwondo & Hapkido Association) and MHF (Midwest Hapkido Federation). He also serves as a Senior Examiner and National Officer for Taekwon-do International, assisting regional black belts with training and certification as Black Belts, Instructors and School or Club Owners. Brooks is a "Human Performance Specialist" and regularly provides clinics and seminars to college and high school athletic teams. A ten year cancer survivor, Master Brooks seeks to motivate and inspire students as a living example of perseverance and service to others. 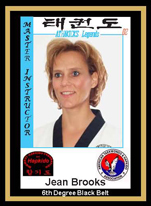 Jean Brooks 7th Degree Black Belt Taekwondo, Master Instructor, 5th Degree Black Belt Hapkido. Senior Examiner for Taekwon-do International. Mrs. Brooks is a former National Taekwondo Champion, 3 time world chamionships medalsit and was a member of the 1992 ATA National Demonstration Team. She is an accomplished competition coach who has trained many national and regional champions. She innovated a successful pre-school Taekwondo program in the early 90's and has developed and implemented a proven curriculum for the youngest martial artists. Many of her pre-school students continue on and earn the rank of Black Belt after entering the Junior program. Jean is also a specialist in women's self defense, a fitness instructor and a Certified Respiratory Therapist. <?xml:namespace prefix = o ns = "urn:schemas-microsoft-com:office:office" />Roger Alan Pence - Mr. Pence has been a Black Belt since 1978 and has served as head instructor, regional officer, certified instructor and Judge since 1982. An active duty soldier, Mr. Pence has completed 3 tours of duty in Iraq and is a Blackhawk Helicopter Pilot. Pence is currently stationed in Arizona, where he serves as an association advisor.